ACTIVITY 5.1 Conversions with the decimal metric system (units of length). The objective of this activity is to create a sheet to convert values expressed in different units of length (km, hm ...) to a single unit of measurement (meter). To write other expressions, you just have to do the same process and write whatever other name of unit within quotes. 14. Format the cell D11 with two decimal places. 15. Format the cell D12 with three decimals. 16. Make the width that conveys from the columns. 17. Protect the cells that you agree to. To protect the ceeties that you agree, you just have to unprotect the cells where the numbers are written and then protect the sheet. 18. Change the cell values ​​of the B6: B12 range to check how conversions are made automatically. Activate sheet 5.3 in your activity template. 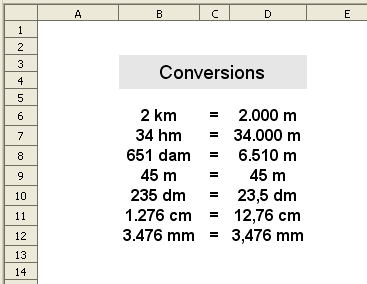 In the image below are shown the formulas needed to calculate the conversion of units in D5: J11. In D5 write = $ B5 * D $ 3 / $ A5 and extend to J11.